A client asked more about the Lift app and how I use it...so here is a quick response. What I like to do is "move" the habits in an order that makes sense to me. My Lift App ListThe nice thing is that you can easily see which have been done, and which need completeing. You can easily see how you did for the week or month, or more...for each of your habits. "Habits are great when they help us get what we want. Bad habits, on the other hand, are bad because the shortcut that satisfies us in the moment gets in the way of our long term goals." Here's a link to an audio interview with Lift Co-founder Tony Stubblebine. You may attend boot camp classes with me during the week, but what activities do you do over your weekend to keep yourself on track? For those of us who are lucky to live in the Pasadena area, our weather provides so many opportunities to get outside and take advantage. One of the best activities is to just get out and walk. This is a great time to encourage your family to be part of your healthy life, you may be doing them a huge favor by getting them up and moving. 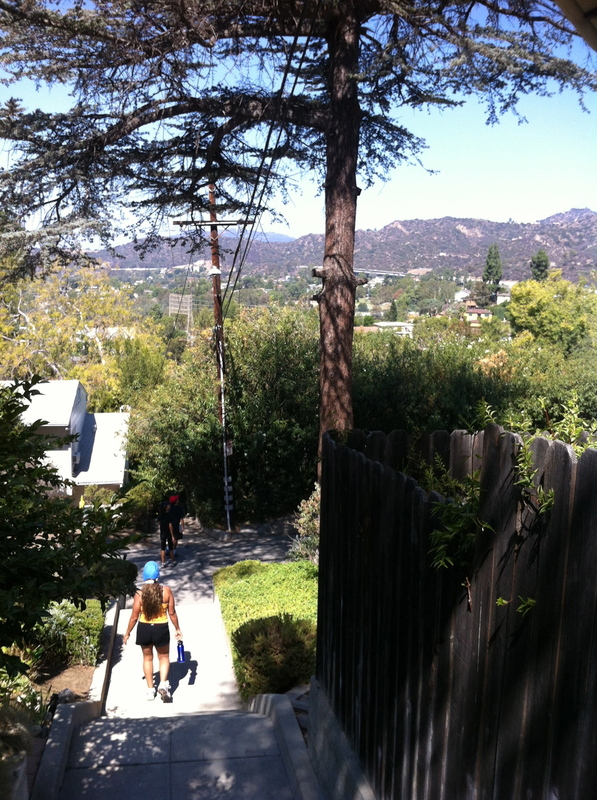 One of our favorite activities is going on the stair walks from the book, Secret Stairs: A Walking Guide to the Historic Staircases of Los Angeles by Charles Fleming. When I'm crunched for time, I knock out a simple jump rope workout. I will set my timer on my phone for 20 minutes, and have it notify me every 30 seconds. For 30 seconds I'll jump rope, then for 30 seconds I'll "recover" with squats. I'll repeat this pattern for the entire 20 minutes. There are two weekend options for you. What else do you like to do over your weekend to stay fit? I continue to hear great results from the Challenge. Lot's of comments with people losing 10 pounds in the first 3 weeks. A few of you have contacted me and/or Amy too to discuss "tweaking" your diet. If you aren't seeing the results you had hoped for, by all means get a hold of me. We'll look deeper in to what's going on. Speaking of "being here" for you, I have streamlined a few things that may make me more available and to help you better. As the number of clients increased in the last camp I was a bit overwhelmed. Many new people joined and my "regulars" stayed...this created the biggest classes to date. I have been working hard on trying to organise some things better which should make your experience better. I'm a life long learner and am always trying to get the most out of life, but in a balanced manner. I have begun to take "attendance" electronically. I will now be sending emails to those who miss their session. This method also allows me to run reports on how often you come to class, or have missed. It will be telling for you and I. I realize that people travel, etc., but please keep in mind that there are only 12 opportunities, or 8, depending on your session... for you to attend. Clear out your schedules the best you can to make each session. By the way, the classes are designed in such a manner that if you miss a day, you are missing a day of the "larger plan". We don't have many boot camp classes left in this year. The next MWF camps begin on October 11 and run till November 5. We then have two short sessions because of the holidays. November 29 - December 17 has 9 class meetings. If you haven't already, please let me know if you will be in the next camp (Oct 11 - Nov 5). If you know that you want to be in the other two camps too, by all means let me know...I may even give you a discount for registering for all 3 remaining camps. Like I mentioned, be careful over the weekend as often there are more temptations. Thanks to everyone for the birthday wishes, notes, and cards. I can't explain to you how lucky and fortunate I feel. I have a wonderful wife who has been my backbone of support. Meeting are marrying her has been the most positive and meaningful thing that has happened in my life. Having healthy, happy and adventurous minded kids is a great blessing and a lot of fun. To my clients, I am very grateful that our paths have crossed. 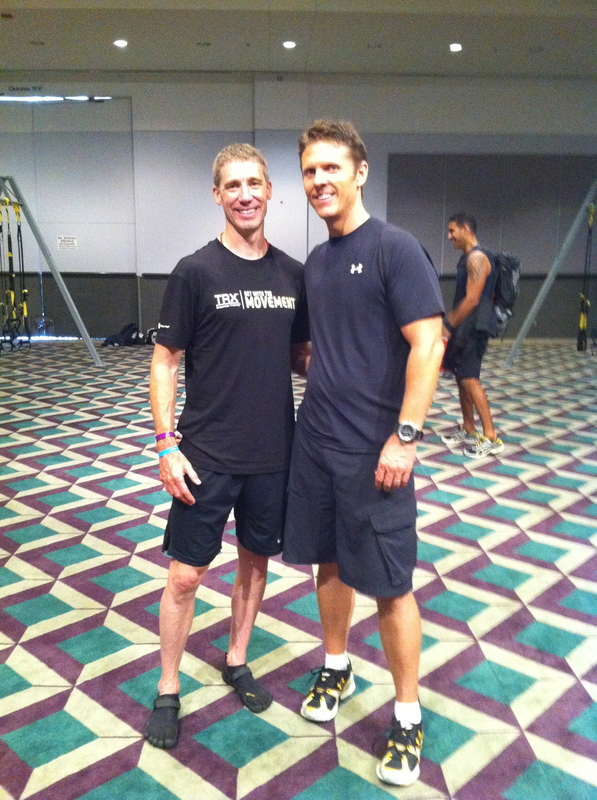 Yesterday I helped out my coach, Todd Durkin as he rallied about 250 fitness professionals at the L.A. convention center. The IDEA conference is attended by close to 5,000 fitness pros from all over the world. I met people from Japan, Turkey, and Singapore. I worked with an incredible team yesterday. Here are just a few of the guys. Dr. Chris Mohr, Sports Nutritionist for the Cincinnati Bengals and is also the Sports Nutritionist for Under Armour’s TNP Training Council. For about and hour and a half groups of attendees were put through the ringer at each station. I was at the ropes station. What a blast. The participants were sweating like crazy after their time with us. 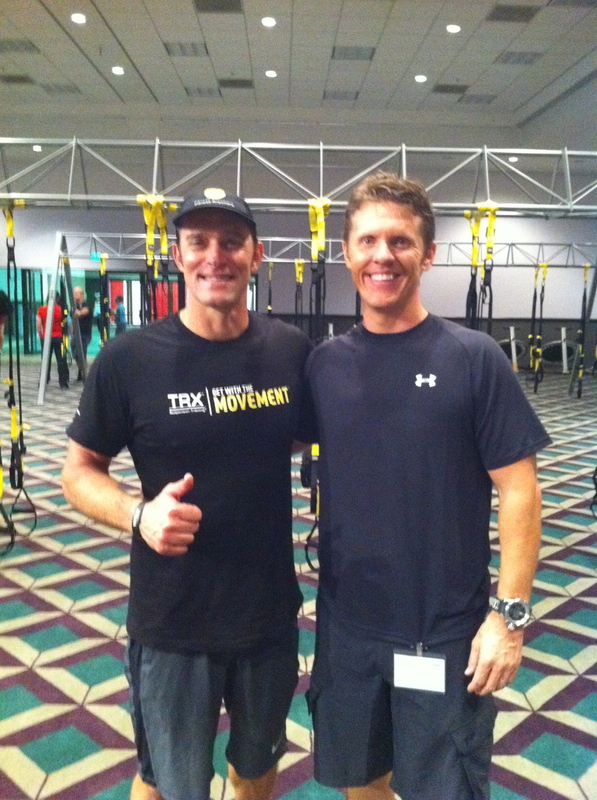 I had some time to talk to Randy Hetrick, creator of the TRX, and also Fraser Quelch, the director of training and development for Fitness Anywhere. 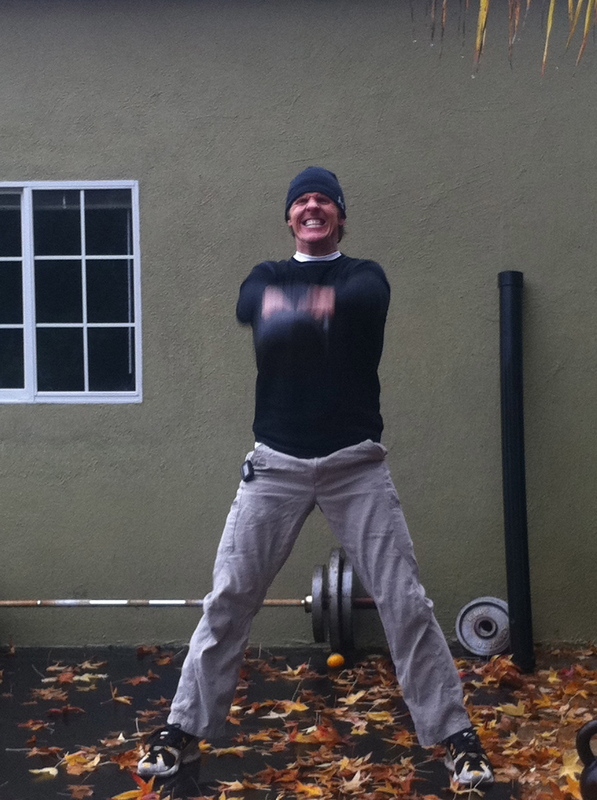 I was trying to get any tips I could on spreading the fun for you guys in our boot camp sessions. 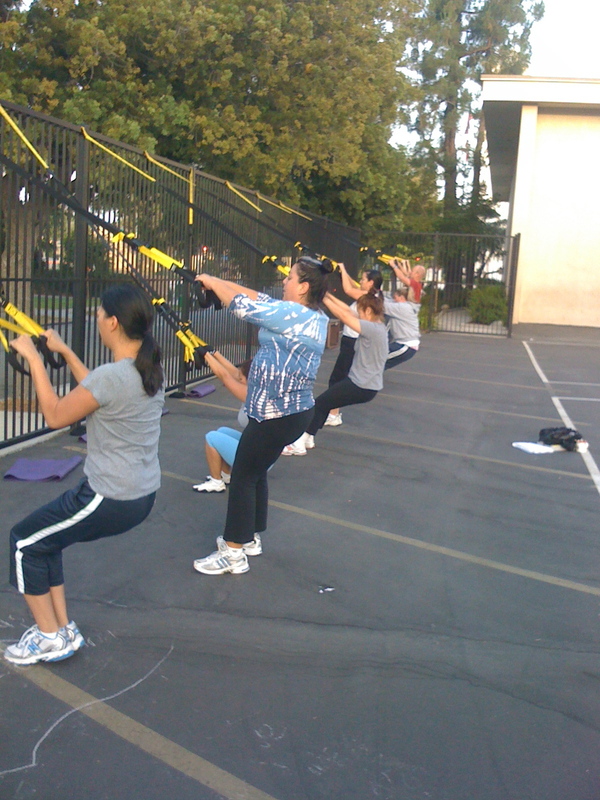 Morning boot campers working on the TRXYour success with losing fat during our boot camp , and keeping it off will depend a lot on creating balance in your life. The best way I've found to do this is by showing up and training hard during the week. In our case Monday, Wednesday, and Friday, are our training days. My hope is that you have made it to each session and trained as hard as you could. If you are trying to lose fat, which most of you in the boot camp have told me is your goal, then eating well should be right on target 6 days a week. So now we've come to Saturday and Sunday. For many this can be challenging. Parties, bar-b-ques, weddings, etc., all of these usually include some rich foods, and many times alcohol. If you have trained hard, and eaten well during the rest of the week, one day won't set you back on your goal to fat loss. Your body may even "need" the shock to keep your metabolism revving. Enjoying the weekend with my daughter. As you plan your week, keep in mind the one day which you'd like to treat yourself. In my own example, last weekend we had a big get together to watch the World Cup game in which Brazil was playing. I knew that I would want to eat more than usual, plus there were some desserts I wanted to eat. I ate basically whatever I wanted without the worry that I would gain weight. It's a good feeling to enjoy life. The problem becomes when we over do it the rest of the week. Plan your week. If you need help with your specific situation, please contact me. To see the rest of the album click on the picture. To those who came on Saturday, thanks so much. I was so much fun to see your smiles and hear your laughter. If you'd like more information about Gracie Barra Jiu Jitsu in Arcadia be sure to contact them. I've written about this before, but I believe that this is critical if you want to stay lean and healthy. Our lives are getting way more complicated and there is no "off button". Everyone seems to always be on and connected. I too am guilty of this. Checking email, scanning Facebook...it never ends. My challenge for you today is to find 3 things that are preventing you from being at your desired weight or fitness level and to eliminate them. Things like watching 2 hours of TV at night and not going to bed early enough. Not planning your meals and having to grab fast food. Surfing the internet and then not having time to home cook a healthy meal. There are many more, you just have to choose 3 and eliminate them. The second part of this exercise is to add 1 good thing. Walking around the block with your family or dog. Once again there are many and you just have to add one. Let me know what you come up with in the comment section below. 1. Eliminated checking email, Facebook, etc. to 2x a day. This is way down for me. 2. Streamlined my "to do" list to something very basic (low tech). 3. Finish work by 4p so I can cook dinner and spend time with my family. 1. Riding my bike for short errands. My hope is that you have been earing clean and training hard so that when Thursday comes, you'll be able to enjoy all of your Thanksgiving favorites without any guilt. Holidays like Thanksgiving and Christmas should be fun, and filled with loved ones and good food. I would rather that you go overboard a few times a year, then skimp and try to plan a diet, or low fat holiday. Enjoy each day, be thankful each day...we have been given a tremendous gift. P.S. The videos below are from my hike the other day. On the video I mention one of the reasons why I enjoy being in shape. It's nice to look nice, but the benefits of feeling great and able to do whatever your body asks is tops in my book. You know when you go to a store and someone says that..."may I help you?". It sounds so insincere. It's difficult to put this across in an email, but I really do want to know how to help you. I've made a short video today where I talk about your goals in taking the boot camp. When I think of my job as your trainer I have a couple of main points on my mind.The first is to help you achieve your goal as fast and as safely as possible. Each email, video, workout, etc., has your goal in mind. The second goal is to help you develop these skills and techniques so that you'll make them a habit in your own life. So having said that, I'd really like to know what can I do to help? Is it more videos, emails, articles, more training days, weekend sessions? I'm totally open to hearing from you and your ideas. Take 2 minutes to watch the video, and let me know. For some of you, you have never met me before taking this boot camp, so I want to take a few minutes to let you know how I feel about "our relationship". That's really what training with a coach or trainer comes down to...it's about a relationship. Most of the time when I take on a trainee like yourself, he or she is coming to me to lose weight. The nice thing about training is that if you put in the work, and eat relatively clean or healthy, the weight specifically the fat, will come off. Just as you may have put it on by bad eating habits and no exercise, the good thing is that it will come off as soon as you reverse those habits. But, there is much more to losing the fat. Stress, lack of sleep, and so on.